Residents debate mayor’s plan to demolish The Landing - The Resident Community News Group, Inc. | The Resident Community News Group, Inc.
Not everyone is on board with Mayor Lenny Curry’s idea to have the City of Jacksonville buy back and demolish The Jacksonville Landing in favor of building a riverfront park. In fact, many are alarmed with the speed at which the Mayor’s plan is being pushed through City Hall. On March 26, after much discussion, the City Council approved, 15-1, Ordinance 2019-134, proposed by the Mayor, to allocate $18 million to buy out Jacksonville Landing Investments LLC’s long-term lease. Councilman Danny Becton’s last-minute floor amendment to approve $18 million, paying $15 million to developer Toney Sleiman right away but delaying demolition until later, was soundly rejected by the Council. In addition to Sleiman’s payment, the final deal includes $1.5 million to terminate leases and relocate tenants and $1.5 million to demolish and clear the site. Demolition could begin in six months, said Downtown Investment Authority Interim CEO Brian Hughes. If razed, it will be the second city landmark to be demolished this year. In January, the City tore down the former City Hall annex and old courthouse on East Bay Street, scrapping plans to build a convention center on the site and leaving another vacant parcel in the heart of the city with no clear plan for the property. Juliette Vaughn of San Marco and other area residents are angry at the prospect of losing The Landing. Vaughn signed and shared an online petition requesting City Councilmembers think twice before signing off on its demolition. As of March 28, over 1,200 residents have signed Vaughn’s petition. “As the City grants approval to demolish buildings at such an alarming rate with no clear vision of future development, it erases its history and possibilities one-by-one,” it reads. Marjorie Broward of San Jose shares similar concerns. She wrote a guest editorial for the Times-Union suggesting the site be repurposed into an arts entertainment center. “Serious consideration should be given to repurposing The Landing. There is steel in the buildings, so I don’t believe it is in imminent danger of ‘rotting,’ but obviously that needs to be determined by an unbiased engineer,” she said. “I do not favor a big waterfront park because a park, of itself, would not draw crowds of people downtown. Some green space on the river, perhaps, but not the whole area. We already have too many under-utilized or neglected parks. It could become a picnic spot for the homeless and a trashy area of plastic,” she said. “Jacksonville has a plethora of talented artists, architects, and planners. The City needs to ask for their input so whatever happens in that space is a creative, innovated use. We do not need another new 19th century addition to Downtown. “Whether repurposed or demolished and rebuilt, I believe The Landing is a viable space for an arts center. There could be art galleries, craft galleries, and stores to sell artists’ work as well as a small hall for chamber groups and recitals, and an outdoor stage for under-the-stars concerts, opera, Shakespearean plays or ballet. Coffee shops, tea shops and restaurants could be included. It could be a true mixed-use area focusing only on arts-related ventures, to be determined by members of the Cultural Council,” she said. Broward’s daughter, Kris Barnes, shared her mother’s views. “I oppose the City’s plan to demolish The Landing without giving the taxpayers time to discuss the options available, and I don’t think another waterfront park is the answer. The goal should be to engage the local citizenry and visitors. If I visit a city, I do not look for a park on the waterfront but rather an area that has an activity I can enjoy. We already have community members who are terrified to come downtown because of isolated incidents that garner the headlines. Barnes agreed that the City should have worked with Sleiman. “Taxpayers should have input before City officials reach a decision. Not repairing the docks after hurricanes, and never coming to an agreement about parking was vindictive by the City. It put another nail in the coffin,” she said. “There has been no desire to see The Landing be successful by the City. It was a true ‘windfall’ for Mr. Sleiman the way things have worked out. Like Vaughn, Avondale’s Steve Williams, CEO of Harbinger Signs, is against razing The Landing. “I sent a notice to the Mayor’s office of ‘PLEASE DO NOT TEAR IT DOWN,’” he said. “The response I got was a wet blanket and an off-putting response of ‘whatever we do there, people will enjoy it for years to come,’ which is I am sure what we heard when we built this originally. Frustrating,” he said. Candidate for City Council At-Large Group 1 Lisa King said her concern about the project relates to a “lack of transparency on future plans” for The Landing. Richard Shieldhouse, a transportation and tourism consultant who lives in Avondale, favors Mayor Curry’s plan to build a park, but questions whether businesses should be relocated Lot J. “I don’t know the details of Khan’s plans, and maybe nobody does. 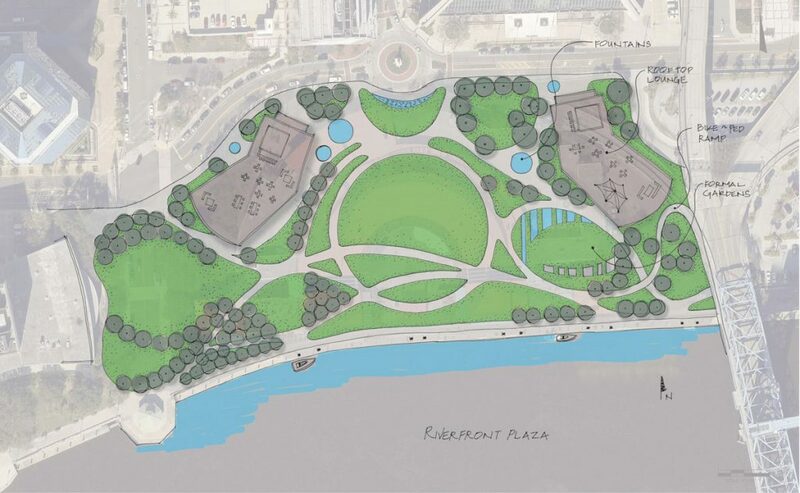 His plans for the amphitheater certainly changed from what was publicly disclosed. My fear is that Khan and his pals in City Hall are going to build a completely new downtown in Lot J and adjacent parcels leaving the existing downtown to become even less desirable for anyone but the homeless,” he said. Shieldhouse agreed that when Sleiman’s firm leased The Landing property, he exacerbated the problem, but said that The Landing was doomed to fail from the beginning. The “festival marketplace concept is only proven to work in places with large tourist flows,” such as Boston, New York, Miami and Baltimore,” he said. While Williams strongly believes The Landing should be revitalized by a development firm like Jamestown Properties, which built Chelsea Market in New York and Ponce City Market in Atlanta, Shieldhouse said he would vote against refurbishing the site, in part because of the way it is designed. “As many have pointed out, the design turns its back on the city. In my opinion, it’s not an exceptional building. Further, retaining the buildings will only sustain memories of colossal failure,” he said. As an alternative, if the idea of building a park is rejected for some reason, Shieldhouse suggests a worthy alternative might be leveling the site and building a mixed-use development with bars, restaurants, grocers, service businesses on the ground floors with residences above. “I would look at what some creative developers, such as Federal Realty, have done building new urban spaces almost from scratch and get involved with them,” he said.